“Miss … is this good enough?” – Every student … ever! The ‘good’ students over-stress about missing even minor details. The ‘average’ students lose interest after deciding they’ll probably not attain top grade through a perceived lack of talent or interest in abstract grades. The ‘bad’ students spend the day feeling that school isn’t for them in the first place. All Students tend to engage in shallow thinking as they simply aim for the target outcome, pre-designed by the system. The teacher feels stress and full responsibility over how they could possibly be expected to manage catering for all 3 situations, ‘good’, ‘average’, and ‘bad’ students in one room. The parents worry about their child’s grades, while knowing that the world outside school is completely different with teams of people working on output together. The classroom suffers from becoming an environment where the teacher is the sole target audience and ideas and opinions from peers have less value. This can have the effect of making the room less busy, as students feel less empowered to make decisions about what opportunities might exist. The worst story I heard this year was a top student attaining a less than perfect grade for a team project, blaming the team and refusing to “ever work with other people again!’ He even changed subjects to avoid all teamwork. This is exactly the opposite mindset to what all industries are crying out for. Aiming for perfect production in the name of abstract grades is also an outdated model no longer of use to industries as they problem-solve, design, and produce for the world. Back in 2015, I wrote a descriptive post on what design thinking is in a classroom but it’s easy to get confused and think it’s about designing big solutions to real-world problems. In it’s truest form, Design Thinking is about big issues but there is also an everyday perspective that all teachers can appreciate. 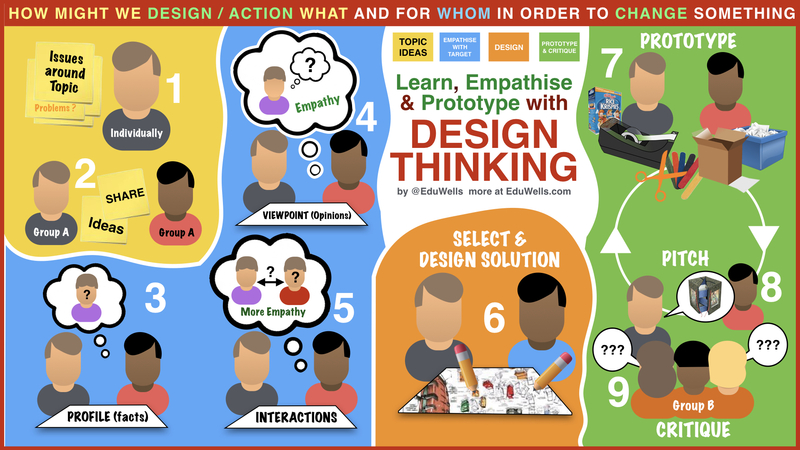 So here’s my breakdown of the stages of design thinking with an aim to improve those everyday classroom experience that many students and teachers would like improved. The key difference between the common classroom practice and a Design Thinking approach is the student mindset changes from passive and processed participant to engaged leader of collaborative learning process (teams of 3 or 4 work well). Design thinking Mindset: How might we design/action activity for us to improve our understanding and abilities? Design Thinking mindset: Timed individual reflection to ensure all individual’s current understandings, struggles, and existing resources are properly considered. Follow this time-slot with a team sharing session to collate all current challenges, resources and existing understandings within the team. Team Facts: What we already know, what we need to know (assessment outlines should be provided in some form), what resources and skills do we have? Team Viewpoints: What makes team members uncomfortable? Why are things challenging? What do members prefer / specialise in? How do people prefer to work? Team interactions: Who might help who within the team? Who else might we turn to? How much do we need the teacher? Should we connect online with others? Design Thinking mindset: Based on their team breakdown of current resources and needs, students set goals, design tasks, and consider schedules appropriate to the team members’ needs, allowing for the class’ learning objectives. Teacher acts as mentor to steer group towards their goals. Common practice: Students hand-in work to teacher and all wait for delayed response. in many cases, after receiving a grade, no reflection or follow-up is based on the results. Design Thinking mindset: After designing their approach, each team presents a short outline of their team’s plan to tackling the specific needs they have within the topic/task and how they propose to evidence their achievement of the learning objectives. The other team give feedback on things they may not have covered and if their preposed idea for presenting the topic will also successfully cover the details in the learning objectives. Teacher roams the room mentoring both the team presentations and audience feedback. Teams then swap roles so that all learning plans can be presented and receive feedback within 15 minutes. This peer review by team audience then repeats at particular intervals during the unit to monitor progress. Yes, teachers do have a new role and it is to develop independent and collaborative learners. Design Thinking is a well documented school and industry tool that helps structure classroom activity, regardless of what the challenge is. In a world that increasingly demands significant new learning challenges annually to most citizens, the confidence in oneself to skilfully take on new learning is more important than any particular piece of knowledge or even other skill.